Your Wishes, Dreams, and Wants Store has everything Disney related for your Hanukkah wish list. 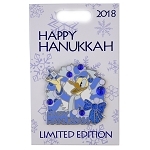 Shop the WDW store for Hanukkah pins and Everything Else! Beloved Disney characters share in the celebration of this festive time as they are featured with the traditions of the season. Make this Hanukkah a memorable one for friends and family with unique holiday products from your WDW store. For a limited time only, the Mickey Mouse Hanukkah 2010 commemorative pin is available. This pin is on sale for $14.95, marked down from $19.95! Celebrate the festival of lights with a pin featuring Mickey and Minnie Mouse lighting a Menorah. This pin also includes the dreidel, a popular Hanukkah tradition. Get reward points every time you shop at the WDW Store. Check out of huge selection of timeless holiday accessories and shop for your seasonal gifts at the WDW Store for Hanukkah and Christmas, a tradition shared with your classic Disney pals!